A Christmas Pavlova Wreath for the Festive Season; Your favourite Berries, Coulis, Mint, and delicious Whipped Cream! I was asked by the lovelies over at Wren’s Kitchens to produce a recipe for them, but the theme was ‘Christmas with a Twist’. I was immediately complete stuck for ideas as my immediate thought was my Christmas Pudding Chocolate Truffles, but they were already on my blog. I wanted to do something new and delicious! 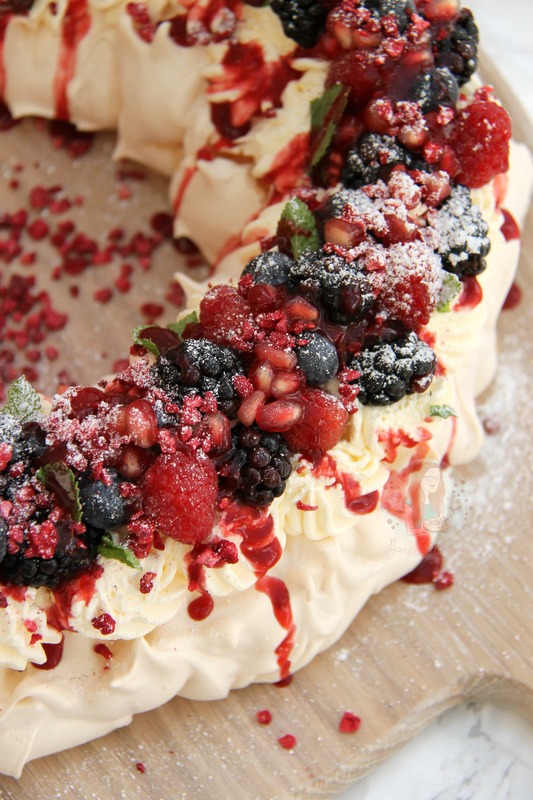 As I already wanted to post a new Pavlova recipe, but with a winter theme I knew this was probably the best idea. 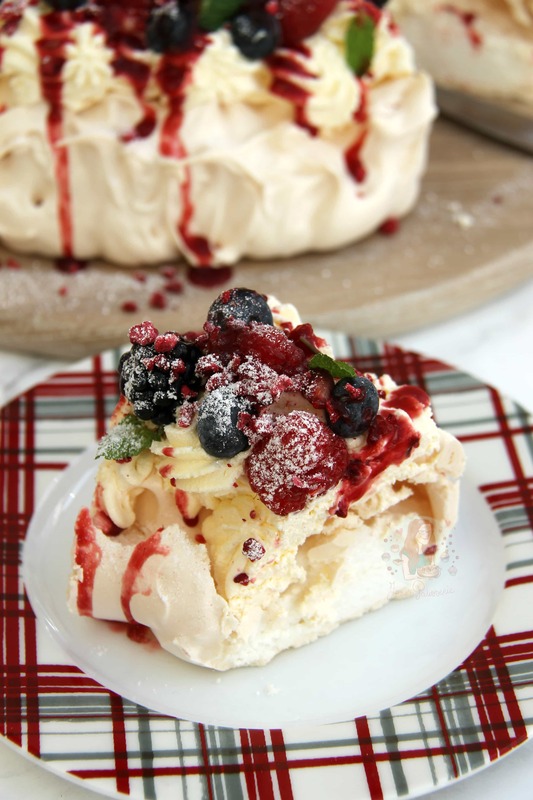 Pavlova is such a great dessert, and it can look so impressive for something relatively simple! However, how do I make it ‘with a twist’?! 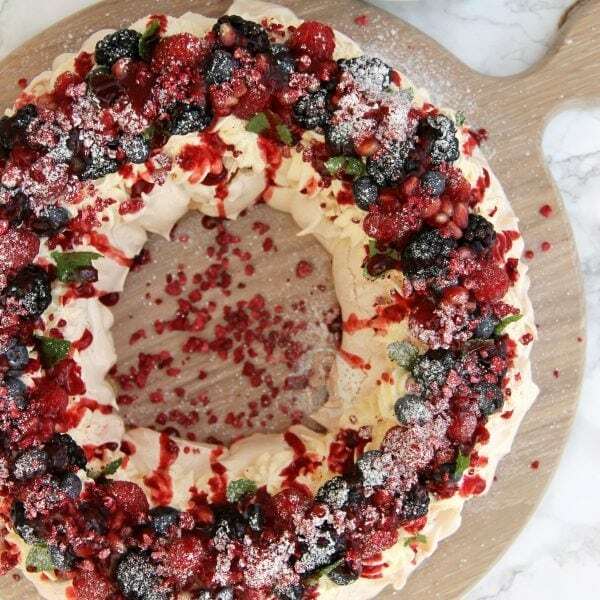 After trawling through Pinterest and a few Cookery Books, I thought I would have a go at the Pavlova Wreath. I tried Mary Berry’s one a few years ago and I adored it, so I knew I had to do this again! I added my own little twists of my personal favourite fruits, a Raspberry Coulis, some mint, some Freeze Dried Raspberries and some Mint Leaves. 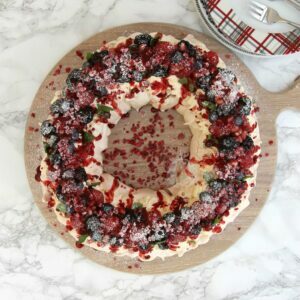 I realise that what I decorate mine with is pretty common, but its a Pavlova, and I wanted it to look Christmas like, so I was a bit restricted on what I could use! I made my life very simple with this delicious dessert. I didn’t feel the need to draw out two circles, but you can if you like. I simple got a very large baking sheet and lined it with parchment paper. Then I got one of my little Cath Kidston bowls that you see in my recipe videos and stuck it in the middle. 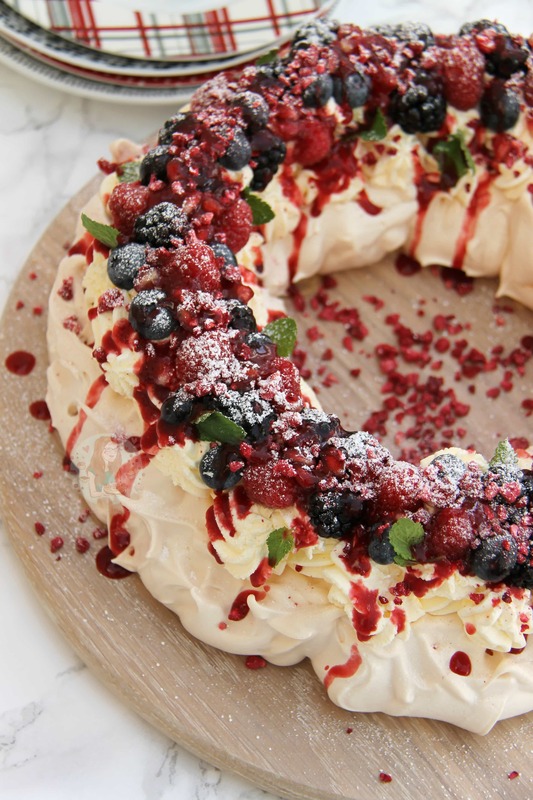 It was pretty easy then to just dollop on the meringue around the edge, and have the perfect wreath shape! 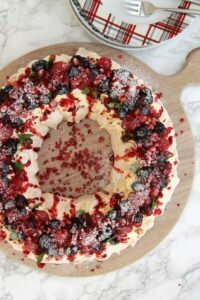 You could of course pipe you meringue to make it very pretty, but like my Spring Pavlova, I just dolloped it on and gave it texture with a fork. I made my own Raspberry Coulis, using the method from my New York Cheesecake. Instead of using Strawberries and Raspberries though, I just used all Raspberries. You can easily use shop bought coulis and there is no shame in that at all, I just love to make my own. You can buy Freeze Dried raspberries in a few supermarkets now such as Waitrose and Sainsbury’s, and the other items you can get pretty much anywhere! I really adore this recipe, and don’t be afraid of it, its much easier than you think! Enjoy! Fruit - Blackberries, Pomegranate, Raspberries, Blueberries etc! Preheat your oven to 150C/130C Fan. Line a LARGE baking tray with baking parchment. Whisk the egg whites with an stand mixer – I use my Kitchen Aid until they form stiff peaks – when you reach this stage, start adding the sugar 1tsp at a time. Once all of the sugar is incorporated it should be glossy! One at a time, whisk in the White Wine Vinegar, then the Cornflour, then the Vanilla and whisk till smooth! Using a small bowl in the middle of the parchment paper, dollop the mixture around it so that once you remove the bowl, it’ll be a ring shape like a wreath! I use a tablespoon and do a large spoonful for each dollop and go round the small bowl till I have used all the mixture up. I then use a fork so spike up little bits to give it texture! Carefully lift out the bowl and bake in the oven for 1 hour – turn off the heat of the oven and leave to cool completely in the oven, without opening the door. I bake my meringues late at night, and leave them to cool overnight to make things easier! Prepare your fruit – chop up any fruits such as the strawberries, and clean all the berries thoroughly! Whip up the double cream with the Icing Sugar. Spread/dollop/pipe the whipped up cream onto the meringue and then add the fruit on top! Add a few mint leaves for colour, and sprinkle with Icing Sugar! I also used a little edible glitter for a bit of Christmas cheer! Enjoy! I used my favourite fruits as I LOVE them combined with cream and meringue – Using seasonal berries are better compared to some of the ones I used, but I happen to know someone who manages to grow these delicious berries all year round and they taste amazing. Anything wintery will suit the dessert well! Frozen berries will also work, but they will produce moisture once they thaw! The Icing Sugar in the Cream, and the Vanilla in the pavlova are optional, but I like my desserts sweet. The Vinegar & Cornflour in the Pavlova are needed to stabilise the meringue, so please don’t leave these out! 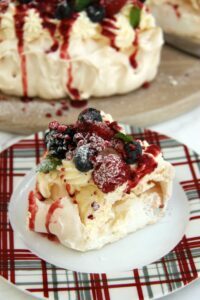 The pavlova is classic, and it nearly always will have some cracks in it but this is the nature of such large Meringues so don’t worry if it happens. As long as your oven is actually the correct temperature (it’s not always what you set it to) and you DON’T open the oven door to let it cool, it’ll be dandy! If you find you have some meringue left over (I personally didn’t) Make some mini pavlovas, and then make Eton Mess with Homemade Meringues! The Meringue itself can be made in advance and stored at room temperature, but its very delicate. I usually make the meringue in the evening and store in the oven (turned off) till I decorate in the morning. Once decorated this lasts 2 days! Find my other Dessert & Christmas Recipes on my Recipes Page! Older Next post: No-Bake Kinder Bueno Cheesecake! 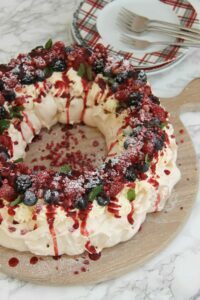 I plan on making this for a christmas dessert, if I were to make it late at night like you do, where would I store that pavlova the next day until it is ready to be served? I genuinely just leave it in the oven, might not be the best, but because of the size of it I find it easiest! Thank you for your posting. I am thinking of making this for thanksgiving dinner. I looked at some of the other recipes including Mary Berry which seems to range from 130 degree celsius to 150 (some called for 200C preheat, turn down to 130C when enter the oven). Does it matter hugely which one I follow? As my recipe mentions, its 150C for your oven, or 130C if you have a fan oven. I’ve got a fan oven, so I use 130C. I would advise sticking to a recipe with what it says, because otherwise it may burn/bake differently. Yeah sorry this didn’t work. Followed your instructions to the letter and as I added the sugar a tsp at a time the meringue went flat (like goopy soup) and couldn’t be saved. I’ve made meringues many times before and have never had this problem. I’ve never experienced this problem – sounds like there might have beens something in the egg whites to cause the issue. Sounds like there’s something wrong with your oven as I’ve never had a pavlova burn, ever. I’m a Home Economics teacher and love your recipes so much. My senior class do a bake off challenge every Monday and many of them use your recipes. 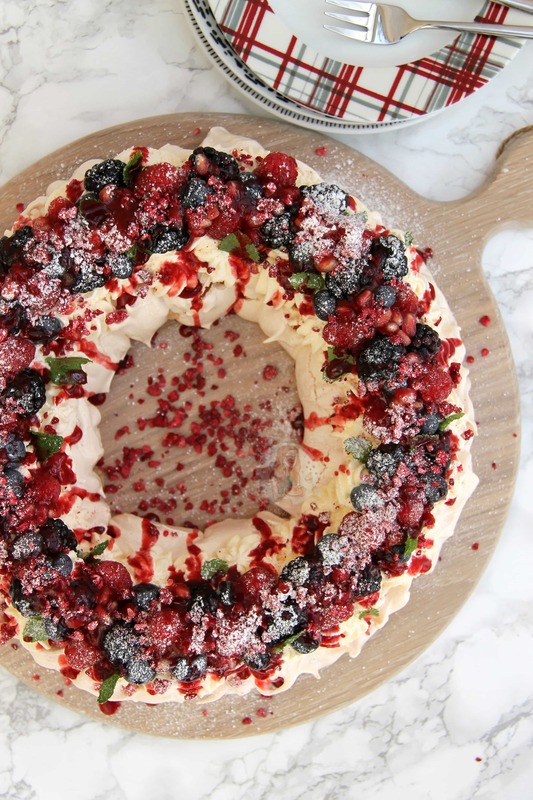 Two of the Christmas Day desserts are from your page – Christmas Pavlova Wreath & Chocolate Orange Tart. Do you remove the meringue from the parchment before serving? So excited to make this for Christmas! This looks delicious – and so pretty! I would love to make this for Xmas. Could you tell me in cms how round the bowl should be. It doesn’t really matter, no bigger than your standard small cereal bowl for example. As long as you have a very large tray, it doesn’t matter how large the middle is as long as you can fit the meringue around it. This such a holiday treat! Stunning Jane! I love the powdered sugar on top for a snowy effect! Makes me all excited for the holidays! Hehehe thank you Cher! And same here!! This looks gorgeous! Thanks for sharing.